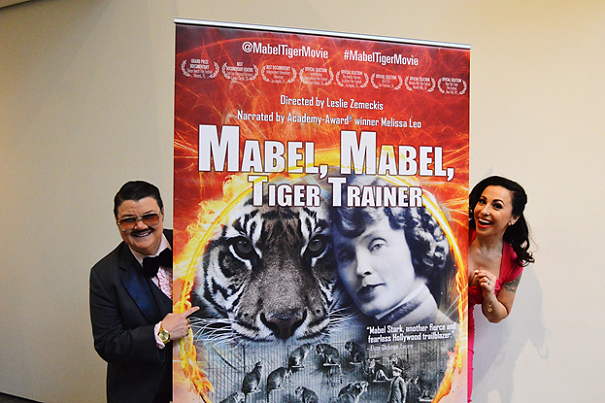 Mabel Stark’s life has been lovingly recounted by filmmaker Leslie Zemeckis in a new documentary titled: Mabel, Mabel, Tiger Trainer. The film will be released domestically on DVD and streaming platforms (Amazon and Vimeo) beginning April 10. LAPX: Why are you so late? LAPX: Well, you look grrrreat! LAPX: Please tell us a bit about the film. LAPX: How did you learn about Mabel Stark? LAPX: So, there is that Burlesque connection? LAPX: Was she doing Burlesque and the circus simultaneously? LAPX: What surprised you the most about Mabel? LAPX: That strength of character seems to fit the overarching theme of your work in exploring the lives of extraordinary women. LAPX: Was Mabel a happy woman? LAPX: She got this satisfaction from what she did with the tigers? LAPX: Do you think she also took some satisfaction in doing something a woman had never done before? LAPX: Mabel was a fixture at Jungleland and she performed in the circus? LAPX: What challenges did you encounter in telling Mabel’s story? LAPX: Given the changes in our time – particularly as it relates to circus animals – could Mabel be a star today? LAPX: Is that kindness method something trainers after Mabel have keyed onto? LAPX: It’s one thing to learn her methods, but do modern-day trainers know who she was? LAPX: What’s next for Leslie Zemeckis? LAPX: Showgirls? But of course!